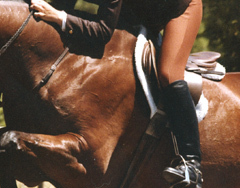 Form follows function is the theme of good equitation. Many of our top Olympians excelled as Medal equitation winners. While most riders and trainers understand the basic equitation position, judging equitation is much more than placing a beauty pageant. It’s rating that undefinable connection between horse and rider and assessing good horsemanship. We ask our experienced horsemen to describe the optimum attributes of a good riding position, and the most important aids that contribute to a solid equitation performance.